Henry and I stopped at the Mmuseumm in August. He has been talking about it several times since so we decided to take a leisurely stroll and stop in again today. It is a really interesting tiny museum that sits inside an old freight elevator that opens to Cortlandt Alley. The ally itself is used as a set for many movie and photo shoots. Years ago I walked by the area on my way to work every day and sometimes stopped to try to figure out what movie was being filmed and spotted a few celebrities too. Washington Market Park shows a few movies outdoors at the end of September and last week Henry and I went to see The Princess Bride. Henry really liked Andre the Giant. Mark was able to join us for The Karate Kid this week. It is a nice, free event in our neighborhood. In 2001, The New York Times placed a stainless steel sculpture by architect, Santiago Calatrava at The American Museum of Natural History which contains over one hundred objects reflecting the culture of the day. It’s intended to serve as a time capsule not to be opened until one thousand years later on January 1, 3000. Below are a couple of photos of Jacqui posing near the capsule back in 2001 and this past weekend joined by Henry. For Halloween this year we took Henry trick-or-treating at the American Museum of Natural History after a fun day celebrating with his daycare friends. So he spent most of his day dressed as a T.Rex which was especially appropriate for the museum visit. Face to face with a monkey pumpkin. Scooping the guts and seeds out before carving. 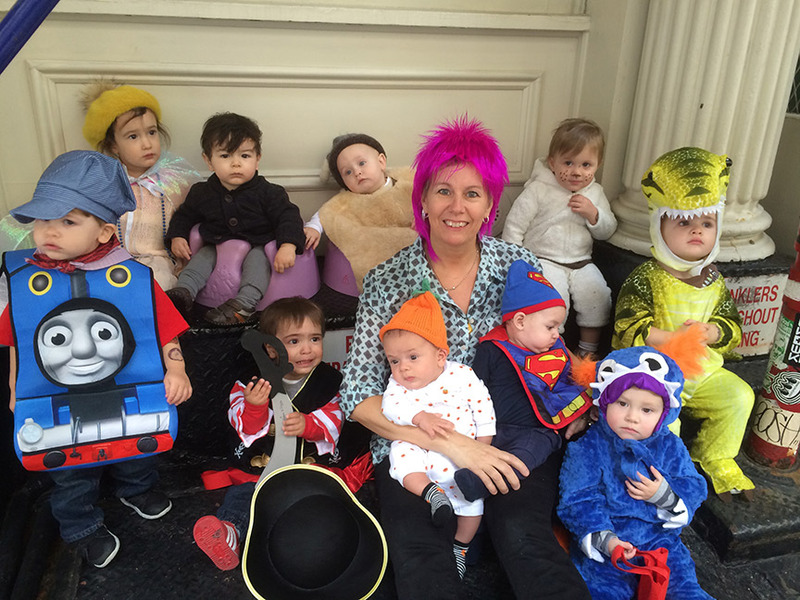 Maryellen and the daycare crew in costume. Trick-or-Treating in the American Museum of Natural History. More dinos enter the museum. Paying respects to an ancestor.